MARIUPOL, Ukraine — It was the worst five-day shift for the Donbas Battalion of Ukrainian volunteers in a long time: one soldier was killed, three were wounded. And on Wednesday, the last day of their shift, the troops were saying goodbye to their late friend Vania. The front between Ukrainian and Russian-backed rebel positions was less than a kilometer wide and lay across a ghost village of shattered buildings called Shyrokyne, currently one of the hottest spots of Ukraine war. Driving to inspect front line artillery positions on Wednesday morning, the battalion's chief commander, nicknamed Gal, looked gloomy. To avoid more losses his units were in bad need of weapons and transport, he said, and those weren’t coming. They needed “much more than American or Canadian training,” he said. How about the truce deal made with with Russia in February? “Forget about it,” said the commander, a tall broad-shouldered man in early fifties. He waved away the question as if it were naïve, or even childish. The dull knocking of artillery could be heard in Shyrokyne, a village shelled day and night, where terrified people live in basements. “If we leave things as they are now, this conflict would last for decades, as it has in Karabakh,” the commander said, referring to the ethnic conflict over the Nagorno-Karabakh between Armenia and Azerbaijan. “Since the last Minsk peace agreement we have not had a single day without enemy fire,” he said. “Separatists shelled us with 100 mm and larger shells, which are supposed to be banned. Look at the holes in the ground and in the walls of our base,” Gal told The Daily Beast, pointing at a former summer resort hotel called Mayak, a half-ruined building currently serving as one of the front line's key positions, 12 kilometers away from Mariupol, an industrial city on the Azov Sea. Violent fighting intensified in Eastern Ukraine earlier this month. International monitors working in combat zones reported hundreds of incidents of explosions in Shyrokyne, and also in the area of the Donetsk airport. 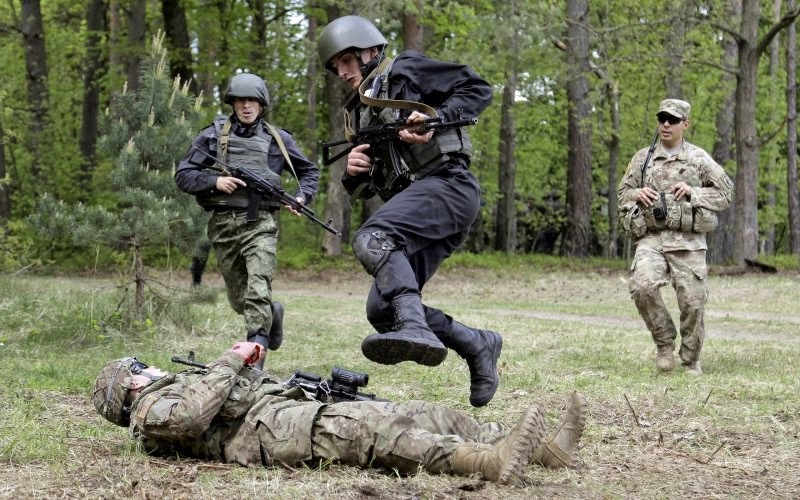 “We are being shot dead here and our commanders tell us to hold fire and hide from separatists in the basement,” one of the soldiers, Alexander, complained to The Daily Beast. At the Ukrainian headquarters in the combat zone soldiers showed off their only ambulance, badly damaged by shrapnel when it was on the way to pick up wounded last weekend. Clearly there are few moral rules in this war. But at least Ukrainian volunteers did not feel lonely: European volunteers from Slovakia, the U.K., Sweden, Croatia and Poland are fighting alongside them. Two Croatian recruits serving in the Azov battalion (and their dog) were having soup in the yard outside the headquarters. “Our ethnic war had a lot in common with Ukraine, that's why Croatians join Ukrainian troops. We are expecting 15 more units to arrive from Croatia in a few days,” said Denis, one of the recruits. All of the volunteers have lost friends and risked their lives, rotating in and out of the frontline positions, but they hold on to political ideologies and religious beliefs that are very different. When the five-day shift was over for Donbas, the Azov battalion took over for its five-day stand. But members of the Donbas battalion did not approve of the Azov battalion's choice of insignia, which look like the lightning bolts of the German SS. Commander Gal's driver, Vadim, a Pole from London, joined the Donbas battalion a few months ago. Vadim believed that if Europe did not defend Ukraine, Poland would come under attack next. On February 15, even as Russian and Ukrainian leaders discussed a peace agreement in Minsk, Vadim lost two of his good friends from the Donbas Battalion. He was exhausted on what he remembers as that “hellish day” and took a nap. A song in Ukrainian woke him up. Vadim said that he sat down and thought how crazy the scene was. “I'm ready to die for Ukraine but not for Adolf Hitler!” he told The Daily Beast. Two things all Ukrainian soldiers and their Western colleagues say they want is unity and peace for Ukraine. No matter how poor the battalion was, it did not take money from oligarchs. “I would quit the day Donbas takes money and becomes dependent on some billionaire, who'd later want us to organize or suppress political rallies for him,” said Gal, a former Soviet officer, who spent a decade sailing on a military vessel of the Far East fleet. The commander was convinced that Ukraine had to free all its territories and the only way to do that was war. The entire Ukraine helped with building materials and money to build fortifications around the Mariupol, the city's mayor Yuriy Khotlubei told The Daily Beast. But Shyrokine, outside that perimeter, “is deadly dangerous,” the mayor said. In Shyrokyne, locals said that when OSCE observers visited the village the fighting stopped. But on May 2, an Organization for Security and Co-operation in Europe vehicle was hit by a bullet, a spokesman for OSCE mission in Ukraine, Michael Bociurkiw, told The Daily Beast. Luckily, none of the observers was injured. “We are not sure who fired at our vehicle but the incident made us once again reassess our security arrangements,” Bociukiw said.